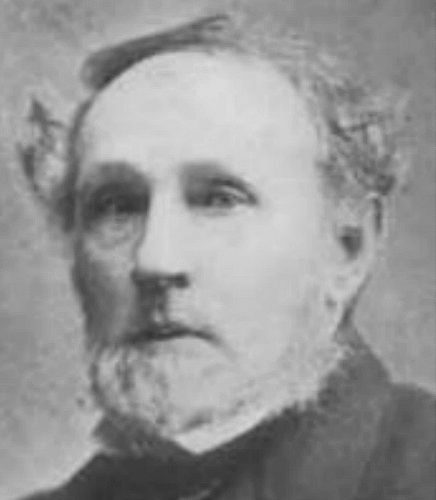 William Anderson Scott was born to parents of Scotch-Irish descent, Eli and Martha Anderson Scott, January 30, 1813, at Rock Creek in Bedford County, Tennessee. 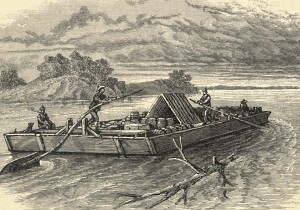 The Scotts found frontier Tennessee a challenging place to live, so after moving to Illinois for a two-year residence with similar difficulties, Eli moved his family back to the South down the Mississippi River in a harrowing trip on a flatboat to Big Creek, which was near what is now the Raleigh area of Memphis, Tennessee. Eli’s two brothers, John and Joshua, also moved their families to Big Creek. The most prosperous brother, Joshua, hired “Miss Ruth” to teach all the children in their own schoolroom. William spent the remainder of his childhood years living on his father’s small farm at Big Creek. He left home when he was sixteen years old to attend Cumberland College, which had been recently established in Princeton, Kentucky, by the Cumberland Presbyterian Church. His mother would die in 1834 and his father would follow her ten years later. William Scott completed his studies at Cumberland in 1833 and moved to Princeton, New Jersey, for his theological education at the seminary. Following his divinity studies, he returned to the South for ordination by the Cumberland Presbyterian Church’s Presbytery of Louisiana, May 17, 1835, for a two-year ministry as a missionary in Louisiana and Arkansas. William then returned to Tennessee to serve as the principal of the Female Academy in Winchester, 1836-1838. One of his most interesting calls was as stated supply to the Ephesus Church, currently known as Hermitage Presbyterian Church, which is located on Andrew Jackson’s estate. A reconstructed Hermitage Church may currently be visited when touring the Jackson estate in Nashville. While supplying the small church of eighteen members including the two-termed ex-president, Rev. Scott was also the principal of the Nashville Female Academy, 1838-1840. After a move to Alabama and a two-year ministry to First Church, Tuscaloosa, Rev. 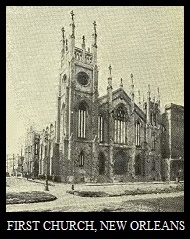 Scott moved to the First Presbyterian Church in New Orleans. Twenty-eight year old Scott was following the brief ministry of recently deceased pastor and former Princeton Seminary professor, John Breckinridge. When Scott completed his ministry in New Orleans in 1854, the next pastor would be former Columbia Seminary professor, B. M. Palmer, who served until his long ministry ended in 1902 when he died from injuries caused by a streetcar accident. The transition from the small town of Tuscaloosa to the great commercial city of New Orleans was a welcome transition for Scott, but he found his departure from Tuscaloosa a sad one. Rev. Scott’s ability to speak French was an asset in the city’s population of French and English speaking residents. His years in New Orleans had their ups and downs, controversies, and difficulties, but his gifts were honed and his preaching greatly improved. When Rev. 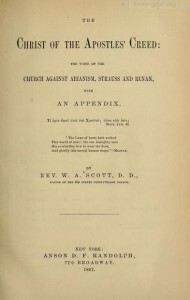 Scott left New Orleans, the church had grown from 341 to 607 members, and it had organized three new churches each with a core group from First Church. William Scott’s next call was across the country in the boom town of San Francisco, California. The city built by forty-niner gold needed another Presbyterian Church, particularly an Old School one, and Scott was the organizing pastor of Calvary Presbyterian Church, 1854-1861. The cooler climate of the new city was more agreeable than that of New Orleans resulting in his having fewer health problems. However, when he accepted his next call in 1863 he moved his family across the country to New York so he could serve the Forty-Second Street Presbyterian Church. In 1870, he again moved his family across country to return to San Francisco where he would pastor St. John’s Presbyterian Church. He quickly became involved in Presbyterian education helping to found San Francisco Theological Seminary in 1871 where he taught systematic theology and philosophy. He continued his pastoral and professorial work until his death, January 14, 1885, just short of his seventy-second birthday. Dr. Scott married Ann Nicholson, January 19, 1836. The Scotts had nine children including two girls and seven boys. Their names were Louisiana, Martha, Benjamin Francis, Calvin Knox, Chalmers, Ebenezer, Paul Eli, Robert Nicholson, and William Anderson, Jr. Ann Scott survived her husband only a few years dying, July 4, 1888. The seminary students described Ann as having been like a mother to them during Dr. Scott’s years of teaching. Other achievements and honors of W. A. Scott’s life included his service as the moderator of the Old School General Assembly in 1855. He was honored with the D.D. by the University of Alabama, 1844, and the LL. D. by the University of New York, 1872. 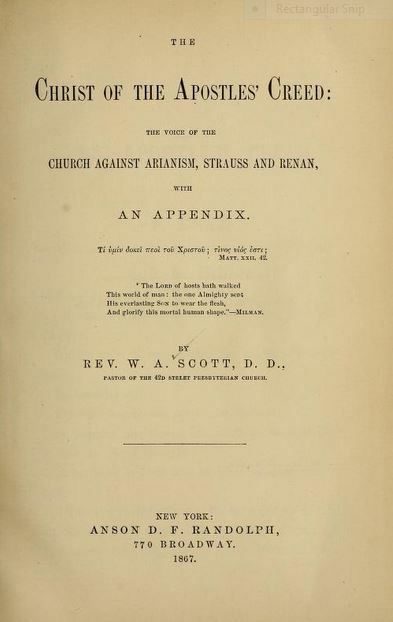 A few of his books are The Christ of the Apostles Creed, The Voice of the Church against Arianism, Strauss and Renan (1867), The Giant Judge (i.e. Samson, 1858), The Bible and Politics (1859), Esther, The Hebrew-Persian Queen (1859), and Moses and the Pentateuch (1863). He also wrote for and edited some ecclesiastical periodicals. For a biography of John Breckinridge on Presbyterians of the Past, click HERE. For a review of the book, Selected Writings of Benjamin Morgan Palmer, click HERE. Notes–The header image of Scott is from a collection held by the PCA Historical Center, Wayne Sparkman, director. Some errors were corrected by the author on December 29, 2016 thanks to comments from Robert Coote of SFTS, and the sources list below was updated. The biography was edited and updated August 19, 2015. Sources–C. M. Drury, William Anderson Scott: “No Ordinary Man,” Glendale: Arthur H. Clarke, 1967, was used to supplement the basic facts found in standard Presbyterian biographical and historical sources. Also used were James Curry, History of the San Francisco Theological Seminary of the Presbyterian Church in the U.S.A. and Its Alumni Association, Vacaville: Reporter Publishing Company, 1907, and Robert R. Coote and John S. Hadsell, San Francisco Theological Seminary: The Shaping of a Western School of the Church, 1871-1998, San Anselmo: First Presbyterian Church, 1999. W. A. Scott, D.D., LL.D. was a wonderful writer. A man of words that touch the heart and soul, and holds the wisdom of truth. thank you for sharing. I am reading about Esther. Thank you for reading the biography and for your gratitude. I hope that the “Presbyterians of the Past” series will remind us all of the saints that have gone before. 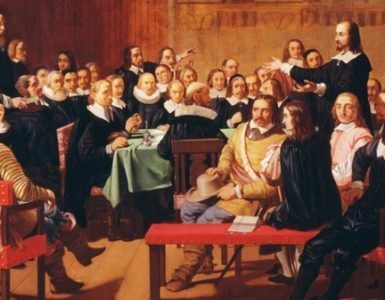 Presbyterian and Reformed scholarship tends to hang its hat on a handful of theologians while there are many forgotten individuals that can provide understanding and inspiration by their examples. I hope you enjoy the biography of William Plumer Jacobs, who was a truly fine minister and man.